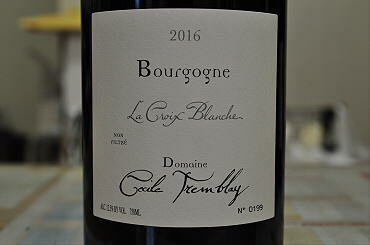 The 2016 Bourgogne Rouge Croix Blanche, which was completely destemmed, has a perfumed bouquet with blackcurrant and raspberry preserve aromas, all very pure and seductive. The palate is medium-bodied with dark berry fruit mixed with a slight touch of cola that receded with time, well defined with a confit-like finish that lingers in the mouth. Fine. The 2015 Bourgogne Rouge Croix Blanche had been racked the previous week to my visit, so perhaps it would explain why the nose felt a little disjointed. The palate is sweet and candied on the entry with spice-tinged, dark cherry and raspberry fruit, sporting a hint of cola on the aftertaste. It should drink well for 2-3 years.